Joe Poerio is an active man with a debilitating problem, diabetes. For several years he had dealt with a number of problems with his left leg. This included wounds and infections that would not easily heal and nagging blood clots that constantly threatened circulation in his leg. After a year of dealing with these diabetes related injuries he was fed up with the constant trips to the doctor and physical limitations he had to endure. So he decided to have his leg amputated. Before the amputation he was constantly in and out of the hospital and eventually fitted for a crow-walker; a large and clumsy orthopedic boot type orthosis designed to release pressure and off load the wounds to allow healing. This type of orthosis made it difficult for him to move around, a big change from his previously active lifestyle. So dealing with all the medical complications and lifestyle changes. Joe decided that amputation was his best option. With his new prosthesis from M H Mandelbaum his mobility has steadily improved and he has been able to work his way back to his previous active lifestyle. The choice was not an easy one, but after the surgery he was sent to M. H. Mandelbaum’s where they were able to fit him with a prosthesis that would allow Mr. Poerio to continue the activities that he loved to do. He had already been referred to M. H. Mandelbaum’s by his foot doctor for his pre-amputation orthoses. He was pleased with his experience at M. H. Mandelbaum’s and discussed his options for a prosthetic leg with them prior to his amputation. Since getting his new prosthesis, Mr. Poerio has been able to go back to golfing and has just returned from a cruise to Alaska where he was able to go dog-sledding. He attributes his easy transition from crow-walker to prosthetic leg to the excellent service he receives at M. H. Mandelbaum’s. 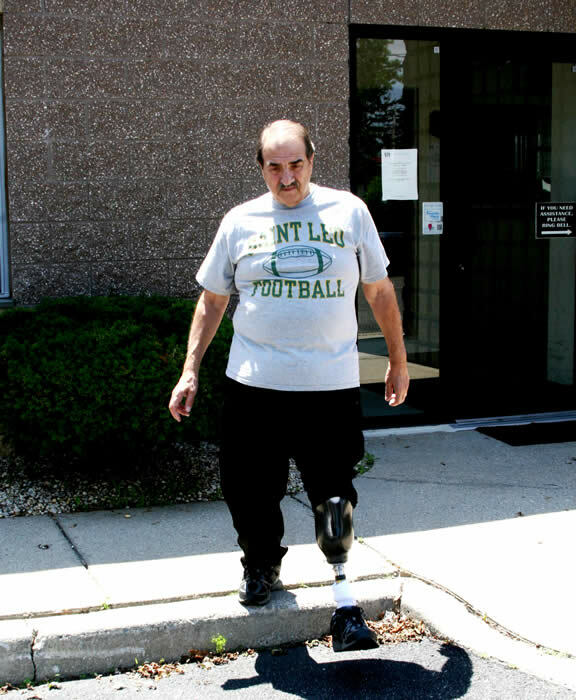 “After assessing my lifestyle they showed me a few different prosthetic options and told me what I would be able to do with each of them” said Mr. Poerio. He chose a type of prosthesis that would give him a higher level of mobility and has been much more active since receiving it. Joe said that Mandelbaum’s staff has effectively helped him with all his adjustments and fitting changes. “The staff is really easy to deal with. I come in about once a month in the beginning,, give them an update on how the prosthesis was feeling, they made a few helpful adjustments if necessary and I was out the door. Joe will be getting the final skin-colored covering over his prosthetic leg shortly and hopes to get into coaching Lacrosse next year. The service here has been great, I’m very happy with my decision to amputate and I have not looked back since. I would urge anyone who is undergoing an amputation to consider using MH Mandelbaum’s prosthetic services, they will take great care of you. We were recommended by a support group to M. H. Mandelbaum Orthotic and Prosthetic Services, Inc. Alexander is almost 2 years old. He was born with a congenital amputation of his left hand. We wanted to give him the option to live with and without a “helping hand”. Alex has a myoelectric prosthesis, which enables him to open and close his hand. As he gets older he will be able to use the full function of this wonderful device. Alex started using the myoelectric prosthesis right away. I cannot believe how quickly he has become acquainted with the prosthesis fitted at M.H. Mandelbaum Orthotic & Prosthetic Services, Inc.
We are so excited for our Alex to be given back his active, toddler lifestyle. hide my leg with pants, and I walked with a cane for 15 years.” said Nancy. Marty Mandelbaum CPO, continuously seeks out products that will enable people to regain their independence. Nancy was introduced to M. H. Mandelbaum’s practice and this particular type orthosis during a support group seminar that she had attended. Nancy agreed to share her experience in order to alert others that there are practical products that could help them regain their independence, and how MH Mandelbaum has helped her. “The brace is very flexible. I now walk without a cane and feel very stable and very secure”, said Nancy.